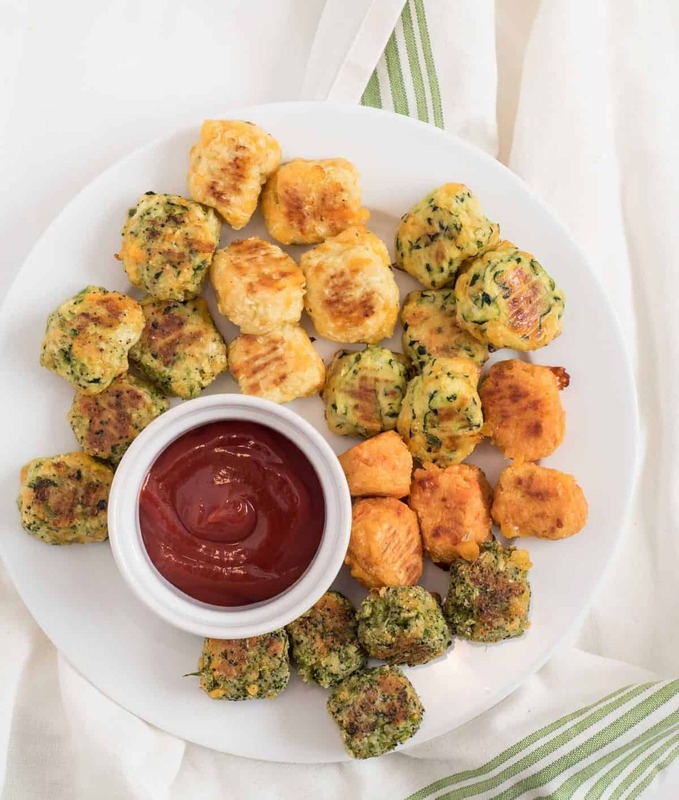 Recipes for healthy veggie tots including broccoli tots, cauli-tots, sweet potato tots, zucchini tots, and mixed veggie tots! Perfect for making veggies fun for kids and adults both! 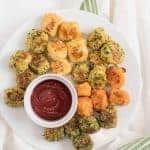 Broccoli tots are the most obvious vegetable tot in the bunch but my kids still loved them. 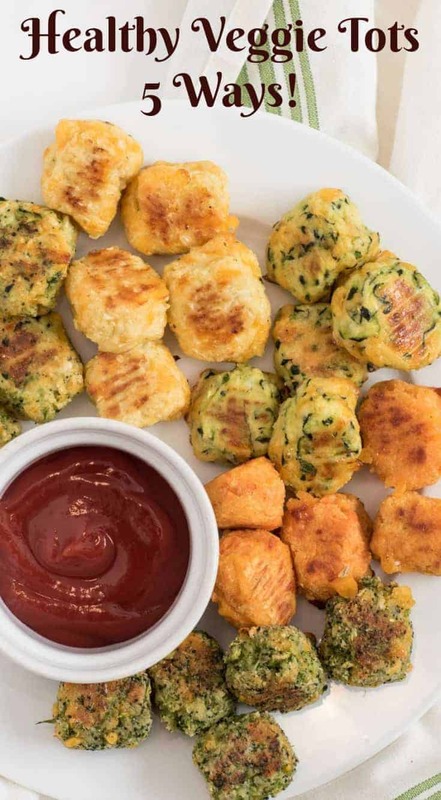 The cauliflower and zucchini tots taste the most like a classic tater tot and those sweet potato tots are such a fun sweet and savory treat that we all loved. 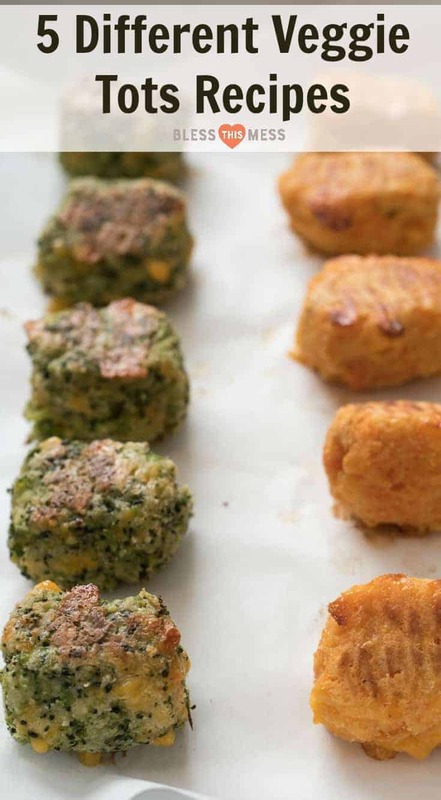 I’m positive you are going to find one you love even if you don’t make all 5 vegetable tot recipes. I think the fact that there is cheese included in these veggie tots is what sold my kids on them. Cheese goes really well with vegetables and when it’s all baked together into fun little dip-able pieces, they just can’t say no. These are also a great recipe to prep ahead and stash in the freezer. I like to make them from start to finish (including baking them). Then just let them cool, pop them in a freezer safe container, and stash until you need a healthy side dish for dinner. I just pull them out and reheat them at 400 degrees for about 15 minutes. Works every time. 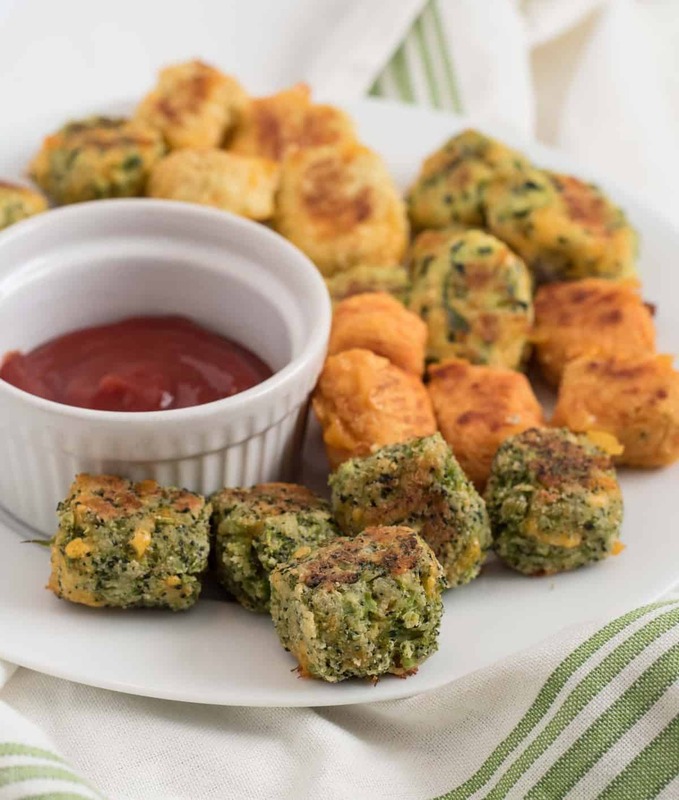 Vegetable tots are the perfect side to just about any meal. 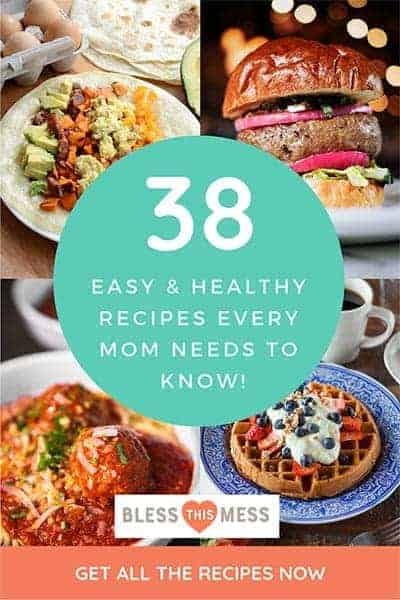 I like to serve them with baked chicken legs, grilled fish, or Slow Cooker Honey Teriyaki Meatballs. Just add a side of fresh fruit and call it a meal. You can use frozen cauliflower or broccoli in this recipe! Just run the frozen veggies under warm water to thaw before “ricing” and sticking them in the microwave. If you don’t use/have a microwave you can steam the veggies, though I find it hard to steam vegetables that have been riced/grated. You can also bake the potato for 15-20 minutes to partial cook it. The amount of moisture in your veggies is going to affect the finished product the most. If you ended up with more water in your zucchini then I did, then your tots will be mushy and not hold together. One way to prevent that is to be sure to remove as much of the water as you can. Another helpful tip is that you can add a little more almond flour or bread crumbs as needed. You should be able to form your vegetable mixture into tots with your hands without making a total mess before they go into the oven. When in doubt, add a little more flour or bread crumbs. I used almond flour in this recipe because it has a great texture and because it’s gluten-free. If that isn’t a concern, feel free to use the bread crumbs (and you can always make your own whole wheat bread crumbs from homemade bread if needed); both work great. Process fresh broccoli or cauliflower in a food processor until it is “riced”, meaning you have pieces about the size of rice. You can also grate/chop to attain the same texture though it takes a little longer. Place two cups of the riced cauliflower or broccoli in a microwave-safe dish (Pyrex measuring cup works great) and microwave on high for 4-5 minutes. Dump the hot “riced” veggies into a medium bowl and allow them to cool for 5 minutes. Add the almond flour or bread crumbs, cheese, egg, garlic powder, onion powder, and salt to the bowl and stir well to combine. The mixture should hold together when you press it in your hand. You can add a few more tablespoons of almond flour or bread crumbs as needed to help the mixture come together. 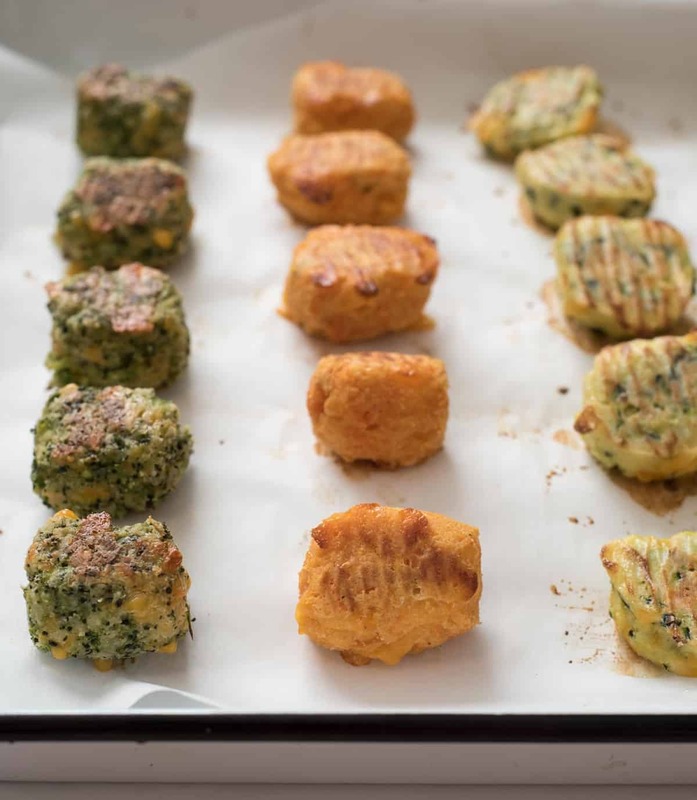 Use your hand to form the veggie mixture into “tot” shaped pieces and place them on the prepared baking sheet until you have used all of the vegetable mixture. Bake for 22-24 minutes, flipping the tots over half way through baking, until the tots are golden brown. Wash a large sweet potato (about 12 ounces) and poke it a few times with a fork. Microwave it for 4 minutes so that it is easy to peel but under cooked. It should not be cooked through. Remove the skin from the potato and then grate the potato on the largest holes of your box grater. Measure out two cups of shredded potato and place it in a medium mixing bowl. 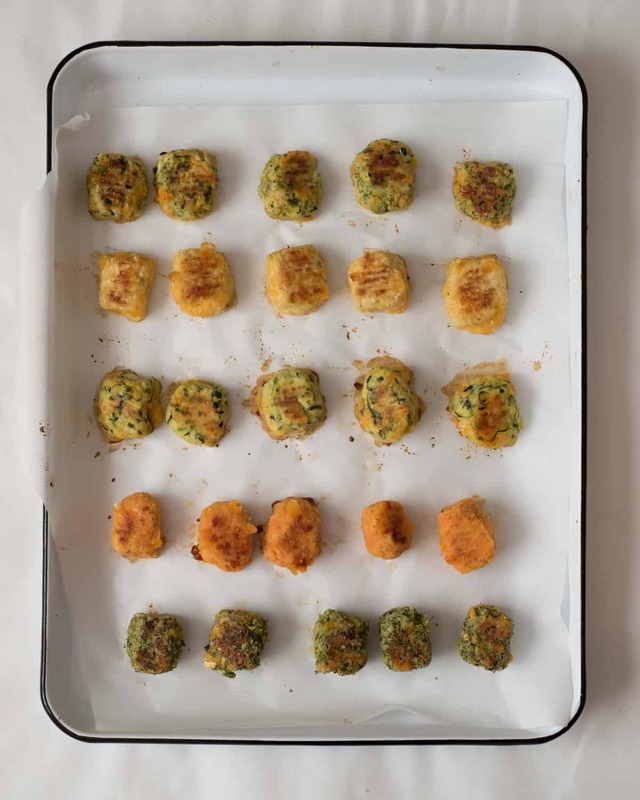 Use your hand to form the potato mixture into “tot” shaped pieces and place them on the prepared baking sheet until you have used all of the vegetable mixture. Bake for 22-24 minutes, flipping the tots over halfway through baking, until the tots are golden brown. Grate the zucchini (two small or one large) on the largest holes of your box grater. Measure out 2 1/2 cups of grated zucchini and place it in a microwave safe dish (Pyrex measuring cup works great) and microwave on high for 4 minutes. Allow the cooked zucchini to cool for 5 minutes. Place the cooked zucchini in a clean dish towel or a few layers of thick paper towels and squeeze it to help remove the water. Your goal is to remove as much water as you can so that your tots hold together. Place the zucchini in a medium mixing bowl. Follow cooking direction for each individual veggie (being sure to remove extra water from zucchini and partially cook the sweet potato) and then combine 2 cups total of cooked veggies in the bowl and proceed as normal. You can use any combination of veggies that you like. We liked sweet potato + zucchini a lot! If you don’t use/have a microwave you can steam the veggies, though I find it hard to steam vegetables that have been riced/grated. You can also bake the potato for 15-20 minutes to partially cook it. 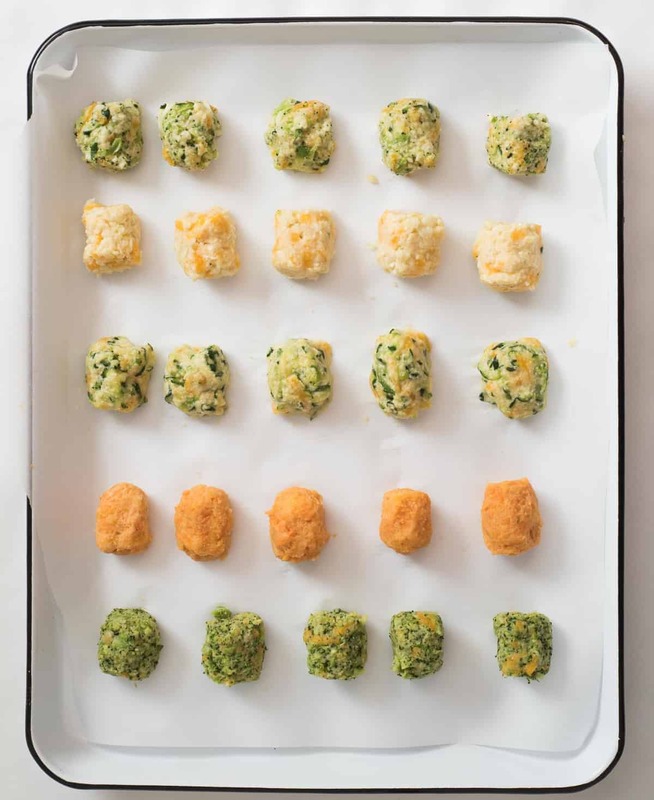 Seriously though, who’s making some cauli-tots or broccoli tots tonight for dinner?! I can’t wait for you to try them. Enjoy from my kitchen to yours! What an awesome idea! These sound delicious, and I’m thinking they would be a fun way to add some veggies into my toddler’s meals. Thanks for the idea, Melissa! Yessssss, seriously the easiest way to get some veggies in the little people #whodoesntlikeketchup? This looks so good! I love how vegetables can be incorporated in such a fun way! This is such a great healthy alternative to fries! 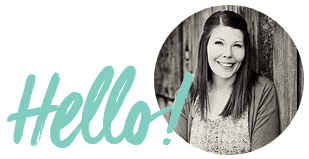 I love all of the variations with the different veggies…I can’t wait to try these! Yep, after you cook them let them cool and then freeze as needed. They reheat best in an air fryer in a hot oven.